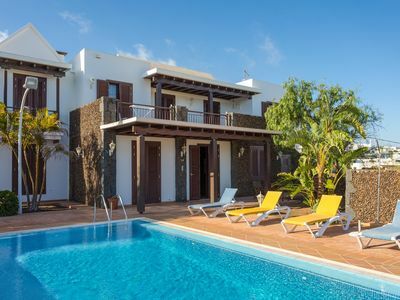 This modern villa is just 5 mins walk to the beach. Part of a small community of similar villas, Villarrica is light, bright and tastefully furnished with 4 bedrooms, air con and shared pool. 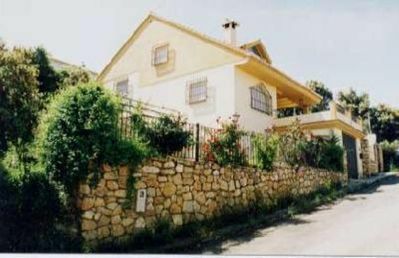 This modern, fully air conditioned Villa is only a 5 minute walk through pine trees to the beach. 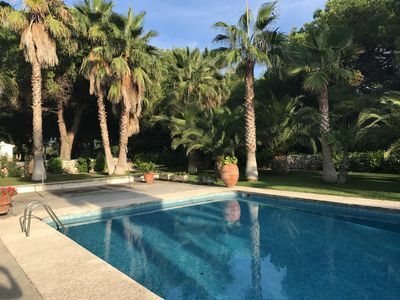 Sitting within its own lawned garden, Villarrica is part of a small community of Villas with shared use of a large swimming pool just a 200m stroll through the communal gardens. 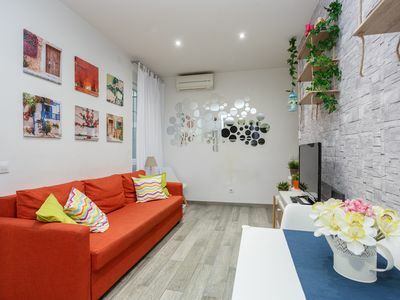 The Villa is light, bright and tastefully furnished with clean, neutral decor. 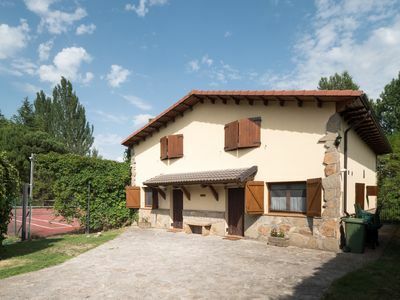 - Large Shared Swimming Pool - 12m x 6m shared swimming pool with roman step entry. Depth 1.10m - 2.10m. 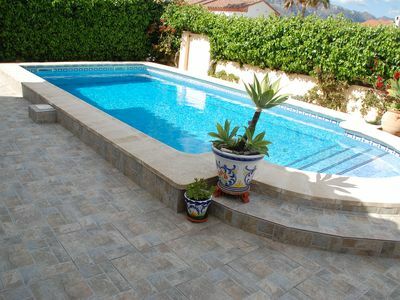 Plus a shallow children's pool with roman step entry depth 0.50m. 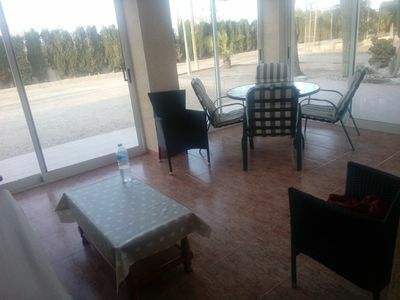 - Covered Dining Terrace - At the rear of the sitting room, there is a covered terrace with dining table and chairs along with a portable barbecue. 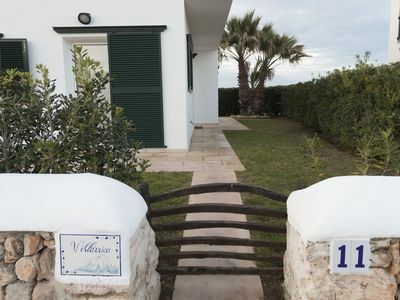 - Private Garden - At the front of the villa with lawn and flower beds. 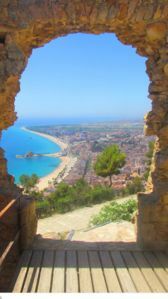 - Sea View Roof Terrace - The roof terrace has lovely open views across the Punta Grossa peninsular to the sea. 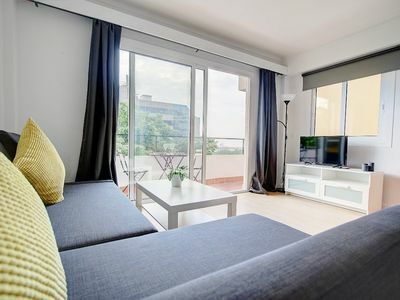 - Spacious first floor balcony with views to Arenal d'en Castell and forested hillsides. 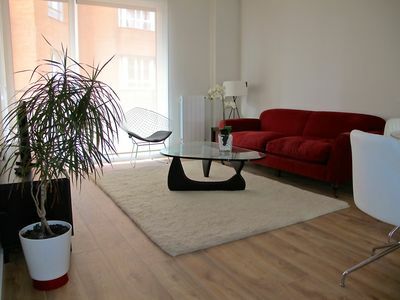 - Living room - 2 comfortable sofas, TV, DVD, CD player. Glass topped dining table and modern chairs. French Doors to the covered dining terrace. Marble staircase to first floor with hand rail. Air con unit. - Kitchen - L shaped run of black granite topped, wooden fronted fitted cupboards, double sink, electric ceramic hob, electric oven, microwave, fridge freezer, dishwasher, washing machine. Door to front garden. Small folding breakfast table. Air con unit. 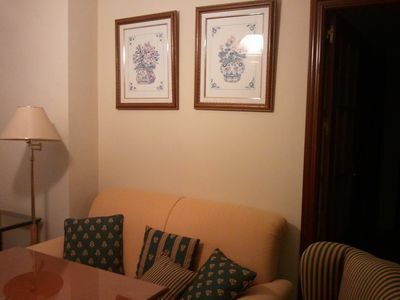 - Twin Bedroom 1, en suite shower room with double bed. Windows to the garden. Smart tiled shower room with shower cubicle. Air con unit. - Twin Bedroom 2 - 2 single beds, full length sliding window with glass safety barrier. Air con unit. Twin Bedroom 3 - 1 double bed, full length sliding window with glass safety barrier. Air con unit. 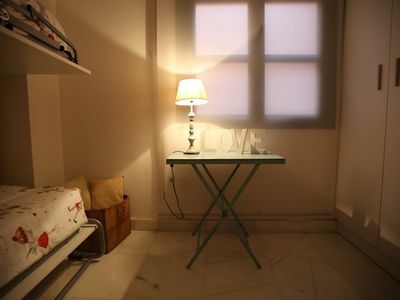 - Single Bedroom 4 - 1 single bed. 2nd bed or a cradle can be added on request. Window to the terrasse. Air con unit. - Family bathroom - Bath with shower attachment, washbasin. - Landing - Patio doors to a balcony with views to Arenal d'en Castell. Stairs to rooftop terrace. You will have a 24 hour emergency contact number. 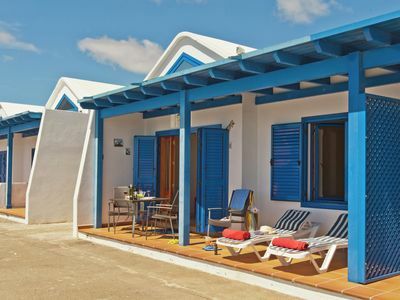 Punta Grossa is a quiet residential area at the far eastern-end of Arenal d'en Castell's beautiful horseshoe beach. 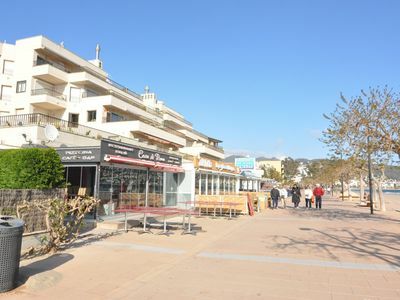 At the back of the beach is a boardwalk which leads to a good choice of restaurants, bars and shops in the village. A twenty minute walk away is the pretty fishing village of Ca'n Macaret along with a small beach and two excellent restaurants. Or a little further away is Port D'Addia which is 45 mins walk or 8 min by car. For keen golfers, Son Parc Golf Course is 10 mins drive away and the historic capital of Mahon are 20 mins by car. Parking - There is parking for one car. It is not usually a problem to park extra cars. 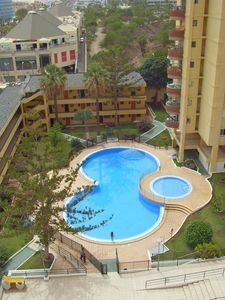 Villarrica is built in 2005 and totally renovated in 2016. 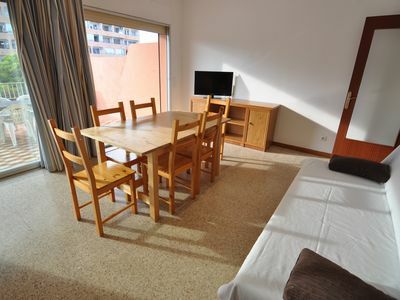 Las Vistas Beach 1 bedroom apartment with sea views Sea View. Casa Alfonso - CASA SUR. 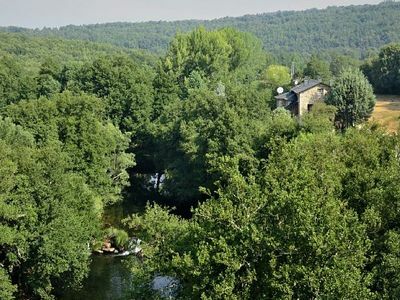 Ideal for getaways, groups of friends and families. 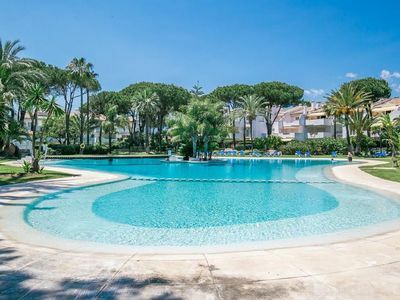 Beautiful apartment in unbeatable area with pool and 100 meters from the beach. GARITA 3B. 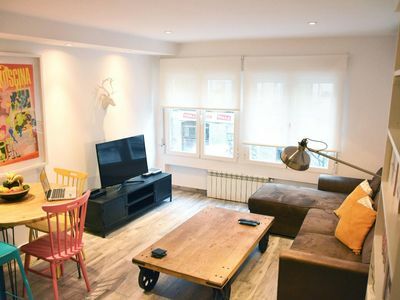 Cozy and recently refurbished 1 bedroom apartment.